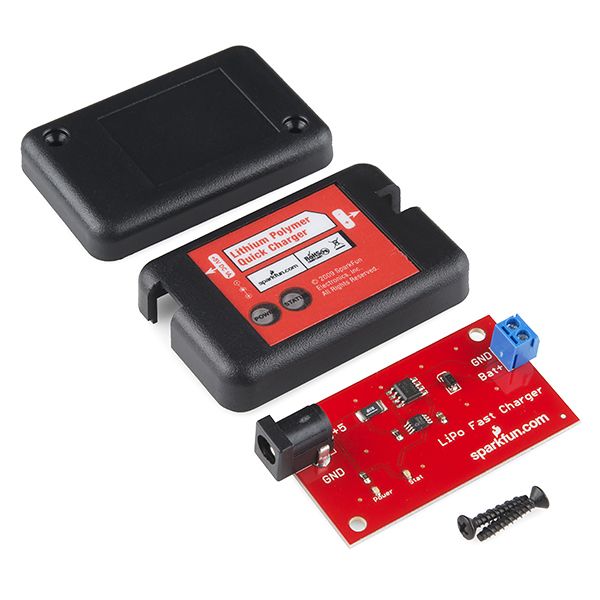 A SparkFun original Lithium Polymer charger. This little black box charges single cell lithium polymer batteries with a max rate of 1A. The charge output is via a 2-pin screw terminal. Top pin is ground, bottom pin is charge pin. Based on the popular Microchip part MCP73843-410. Note: This charger requires a 5V 1A power supply but does NOT include one with the order. A power supply will need to be purchased separately. Looking at Table 5-1 in the MCP73843 datasheet [ https://www.sparkfun.com/datasheets/Prototyping/MCP73843.pdf ] with the schematic [ https://www.sparkfun.com/datasheets/Prototyping/Batteries/LiPo-Fast-Charger-v12.pdf ], the green status LED should turn "ON" only if it is in the preconditioning state or charging the battery. Once the battery is fully charged, the status LED should turn OFF. This is assuming that you are using LiPo battery that is nominal 3.7V. To safely charge a LiPo battery, the capacity should be above 1A. There are times when the LED might flicker. That might happen when the battery drops below the threshold voltage and the charger IC turns on again. Or when there is no battery connected. 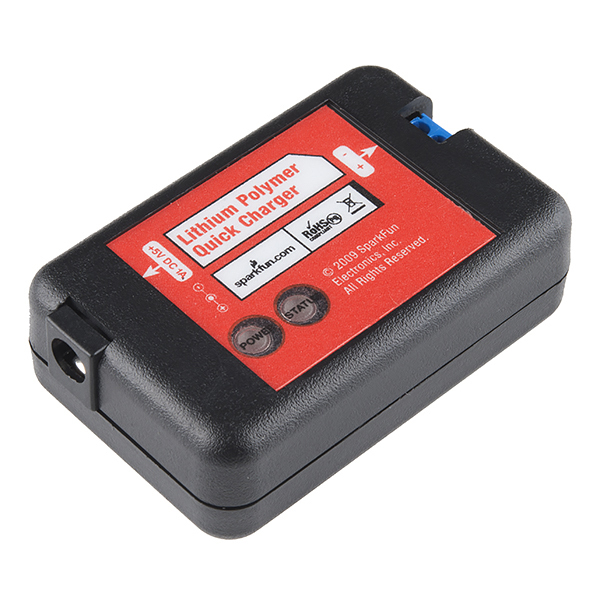 This is similar to our other LiPo charger [ https://learn.sparkfun.com/tutorials/lipo-usb-charger-hookup-guide#inputs-and-outputs ] . The board uses the a similar LiPo charge management IC (MCP73842) but it is set to a different charge rate. Great charger, the board is only slightly larger than the other LiPo 7v one. It says up to 12 volt input, but at 10-12 volts this thing started smoking so I wouldn't recommend going over 5v. So does this auto-stop charging once the battery's full? If not, can someone link me to a schematic/part that does? It slows it to a trickle once it is full. You can't trickle charge LiPos. The MCP73843-410 charges to 4.1V and shuts off (not trickling). I have seen two problems with this. First, if you leave it connected to the battery while the power supply is disconnected current flows through the body diode of the pass transistor and lights the power LED. This drains the battery and makes the power LED useless. I solved this by removing the power LED, but a shottky diode in front of the current sense resistor would be a better solution. This would also keep the battery from discharging if the input is shorted. The second problem is the timer. There is a 1.5 hour fast charge safety timer controlled by C1, a 100 nF capacitor. This means you can't use it on a large pack like the 6 Ah. You just have to replace that capacitor with the value you like -- the timer is proportional to the capacitance. 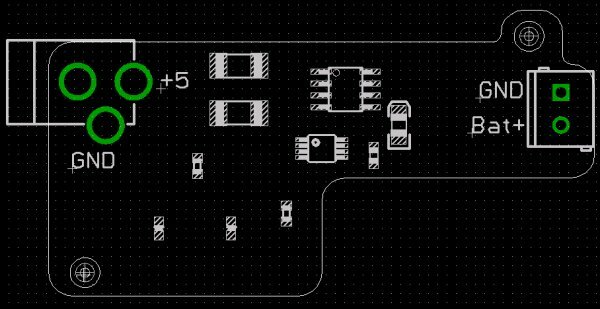 The ideal situation would be to add a footprint to the board so the user can add a second capacitor in parallel to set the charge time. There is plenty of empty space on the PCB, so it should be no problem to add both a through-hole and a SMT capacitor slot. Just blew one up myself as soon as I got it, wish I had read the comments. why oh why doesn't sparkfun correct this in the title, I don't think less people would buy it if it was 5v-7.5v dc instead of 5v-12v.!!!!!!!!! 5V really is required, even though the datasheet for MCP73843 says supply 5-12V. When I connected it to a 5V unregulated wall wart (measures 8.5V with no load), this unit did pull the supply down to 5.1V, but it never charged battery nor turned on the status LED as described in the datasheet. Changed out for regulated 5V and now it charges like a charm. yup I can confirm this: even with a 9V input (correct polarity, of course :) the unit gets kinda toasty and started emitting evil smells. Stick with 5V!! 3 words: Power Supply Ripple. Maybe your wall wart was outer positive? This charger will work on Li Ion batteries but will under charge them by about 10%. These want to be charged to 4.2V versus 4.1V for Li Polymer. Does anyone know if a load can be attached in parallel with the battery? The datasheet of the charge ic does not say anything about this. In 2008 I bought one of these. Yesterday I used it to revive a dying Acer Iconia A1. I knew it would be useful one day! The datasheet recommends using a reverse-bias protection diode to prevent the battery from discharging into the outlet if plugged in backwards: "The optional reverse-blocking protection diode, depicted in Figure 6-1, provides protection from a faulted or shorted input, or from a reversed-polarity input source. Without the protection diode, a faulted or shorted input would discharge the battery pack through the body diode of the external pass transistor." This may have been the cause of some smoking and flames. Also, while the chip itself can handle an input voltage of 4.5 to 12 volts: "4.5 â 12 V"
The power indicator LED setup (LED red in the schematic) does not allow for usage above about 10.75 volts. or for 2.5V@25mA 12 = 2.5 + I(LED)*330 I(LED) = 29mA again potentially enough to damage the circuit. While this might not cause smoking or flames, the power going through the LED resistor would be approaching 1/4 Watt which would definitely be bad for a 1/4 rated resistor after a few hours. The LED resistors are the likely cause of any flames. Another issue is the R(sense) resistor. In the schematic it shows 2 .110 ohm resistors in parallel for a total of .055 ohms which according to the datasheet would put out approximately 2 amps instead of 1. Fortunately, pictures of the actual circuit show only one resistor, so it is likely that this was a simple mistake. The datasheet calls for the drive transistor and current management chip to be placed as close as possible to the battery outlet for proper voltage regulation. I think that Sparkfun could have moved it over an inch to get better results. Overall, if you are looking for a complete Li-Ion solution without worrying about input voltage and bias. Make your own charger on the cheap by following the datasheet for the chip and using a reverse-bias diode, a transistor with a higher wattage rating, and LEDs and caps to match your voltage and capacity specs. The major parts are all about 50 cents each and OSHPark will make you 3 copies of a board for $5 per square inch. You also don't have to pay for a pretty piece of injection molded plastic. Great resource and good circuit, but the devil is in the details. Does any body know if you can leave the battery plugged in to the circuit, and brach of to my arduino to power it, and whenever i need to charge the battery just plug it in to charge it? Can I use this charger to charge the batteries which are on connected to the circuit. I have 4 CR123A rechargable batteries connected to my circuit. Else should I use any other protection circuit before connecting this to the battery..?? Very important: Most CR123A batteries are not rechargeable. Make absolutely sure that you're only connecting this battery to a rechargeable single-cell (1S, 3.7V) Lithium Polymer battery, with a peak charge voltage of 4.2V. Connecting a non-rechargeable Lithium battery to this charger will likely result in damage to the battery or even a fire. As many seem to have trouble with this, it is advisable with nay product to read the datasheet of the devices used, as well as check out the schematic. I've used this chip in commercial products, and it does what it says, but like most chargers, there are caveats. The absolute maximum voltage the charger chip can take is 13V, recommended max 12V - however - the charge current is fixed, there is no thermal cut-off as the pass element (MOSFET in this case) is external. So with 12V in, and say, a half dead battery, 3.6V, the voltage across the mosfet is 12-3.6 = 9.4V. With 1A charge, that will have to dissipate 9.4W in heat. Using a 5V supply? 1.4W. There is hardly any heatsink copper on that board so I think, mounted as it is, the FET can take 2W maximum before it dies of heat. Even with extensive copper pour, I don't see it getting past 4 watts. To be fair, sparkfun did recommend a 5v charger, but no mention of battery capacity. The timer capacitor will have to be changed to give a timeout of greater than the maximum time taken to charge a battery of its specific capacity. This is all in the datasheet, but not completely obvious. I would ask sparkfun to look at switching chargers, perhaps with dip-switch options to set charge current for those who wish to charge 1000mAh to 6Ah batteries, and be able to use between 5 and 15V without things somking. Anyone know what the dimensions of this are? Thanks. Can you post the eagle files? What is the threshold voltage for the status LED? What does it mean when the stat LED flashes green? It comes on solid when charging from Sparkfun's recommended 1000mA charger, but blinks green when I use Sparkfun usb to barrel jack adapter cable powered from either a USB jack cellphone charger 650mA wall wart or a computer USB jack. The battery's voltage was 3.6V when I put it on the charger, so its not an issue with the battery already being over a threshold voltage. Overall, seems like a good unit and it does put out the rated 1A charging current. Btw the board could easily be cut down much smaller, and soldered to instead of using the output jack. During charging the status led frequently starts flashing and charging stops. Only reset is by power off/on. I see other comments about flashing status led, but no response from Sparkfun. Does anyone know why the status led flashes???? With no responses had to âdo it myselfâ; looks like thereâs not much activity on this item. Elapsed time termination timer â 3 hours. The upshot: if your battery is not fully charged in 1.5 hours of fast charge or 3 hours total (preconditioning + fast charge), the charger goes into fault condition (blinking status led) and stops charging. Some of the messages suggest using this charger for the 6 Ah LiPolyâs, but a fully discharged battery will take several (manual) resets of the charger to fully charge. Sparkfun finesses this point (by not mentioning it), but does list the 6 Ah battery in the Related Products section for the charger, and lists the charger under the battery. There should be a caveat! Does this work with your 9 volt wallwart adapter? The description says its 5-12v, but from the comments, it looks like you shouldn't use anything over 5v. My status light no longer functions and I've only used the spark fun 9v adapter. Could we get some official clarification? I've personally used it with 9V just fine. YMMV? I would hope my mileage wouldn't vary. It either is supported or its not any my device is defective. It should work that way, and in my experience, it does. Your mileage has obviously varied since you don't share the same experience. It could be defective. Does it still charge? You would be best to contact techsupport@sparkfun.com if you think it's defective. I?ve one 7.4v 800mah Li-On battery, anyone know if is it possible to use this charger? It will not work. This only charges single cells. The red POWER indicator is illuminated even after the 5v power supply is removed. It can only be using power from the charged battery. What is the point of this? Single T, could you please help? I'm using the charger to charge a new 900mAh 3.7V battery. Well when I connect the battery the "status" light doesn't come on. After an hour, I measure the voltage of the battery and it's still at 0.05V. It doesn't seem to work...what could be the problem? That may have just been the ripple screwing up the chip's sensing. There's no input filter cap. Can I exchange this for the out-of-stock charger that's used in the iphone charger that you link to on the Max1555 charger page? Please contact returns@sparkfun.com for more information on exchanges, and returns. Can someone comment on how the status light should function? I am also curious about the possibility of having a load hooked up in parallel with the battery. The status light is on when the battery is being charged and turns off when it's finished. It is also off if the battery connected is below the proper minimum voltage (pre-charge mode). If you're charging a cell that you know is discharged (possibly too low), just leave it plugged it in and the light should come on once the pre-charge mode completes (perhaps minutes-hours later). Btw, this can be powered from a USB but won't get the full charger current (1A) due to the USB specs. Comparing the schematic to the image of the product, I noticed that instead of using 2 0R11 resistors, you used one beefy "Dale" resistor. What's the value of that resistor? About 0R055? The reason I'm asking is because I'm making a project with limited space and I want to integrate the charger. Can this charge the 6Ah triple cell? It says single cell Poly, not sure what if anything would happen if I hooked it up to the triple. Yes, there is a thread in the comments for the 6Ah battery pack saying that this should be fine. The charger "sees" the battery packs as one pack, since they are in series. However, if they were in parallel, then we'd have to go somewhere else. I think you mean they are in parallel. If they were in series, you'd have a higher voltage and they wouldn't charge. Mine smells funny when I plug it in and charge. I'm using a 9V power supply. Normal? Looking at the schematic, the red power LED is getting the unregulated input voltage through a 330 ohm resistor. Great for 5v supplies, giving 10 mA or thereabouts, not so great for 12v, with 30+ mA. The chip itself is rated for 4.5v-12v input voltage. I just killed one by accidentally plugging it into a 9V supply. The cooked component seems to be the MOSFET. Looking at the data sheet for the NDS8434, the maximum rating for gate to source voltage is 8V. The MCP73843 is probably pulling the gate to ground, and thus exceeding this spec for anything more than an 8V supply. Arguably this is partially Microchip's fault, as they use this MOSFET in their example circuit in the MCP73843 datasheet. 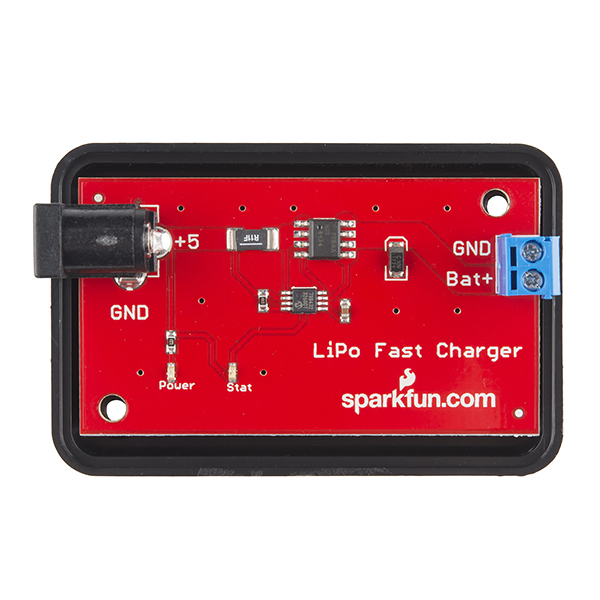 Sparkfun, you probably will want to relabel this product as "LiPoly Fast Charger - 5-8V Input". Will this work with more than one battery or is this a charger like the one that works with 3 - 7 volt input? By looking at this I am thinking that it is only for one, but I am just asking to be sure. Can this be used in parallel or pass thru for small power requirements (e.g. in my car, I want the LiPo providing power when the car is off, but I want it to charge the battery yet still do the ~100ma to the device when it is on. How large is the circuit board? Yes, look on the first page of the datasheet. It will work with Lithium Ion batteries.